Over 30 Surfrider Chapters participated in Hands Across the Sand events across the country on Saturday, May 16th, joining thousands of activists around the world in saying NO to offshore drilling and dirty fuels and YES to clean energy! Photo: Volusia/ Flagler Chapter A grassroots event founded by Surfrider member Dave Rauschkolb in Florida, Hands Across the Sand brings people together to oppose new offshore drilling and other dirty fuel proposals. Participants form "human lines in the sand" by joining hands at their local beach or park to send a message to government leaders. This is the fifth year that supporters across the world have taken action. The Surfrider Foundation served as an official sponsor of the 2015 event as part of our Not the Answer campaign. Other sponsors included: Oceana, Sierra Club, Southern Alliance for Clean Energy, Gulf Restoration Network, Center for a Sustainable Coast, Friends of the Earth, CleanEnergy.org, Urban Paradise Guild, and All things Healing. There was a lot to tackle this year: federal proposals to open the Atlantic and new parts of the Arctic to offshore drilling; permit applications for seismic testing in the Atlantic; fracking proposals nationwide; and West Coast applications for fossil fuel export terminals. Below are some of the highlights from events. We’ve posted additional pictures here. Florida – Chapters along the Florida coast organized this year to oppose offshore drilling and seismic testing in the Atlantic (video/ article/ article); Central Florida tackled hydraulic fracking. 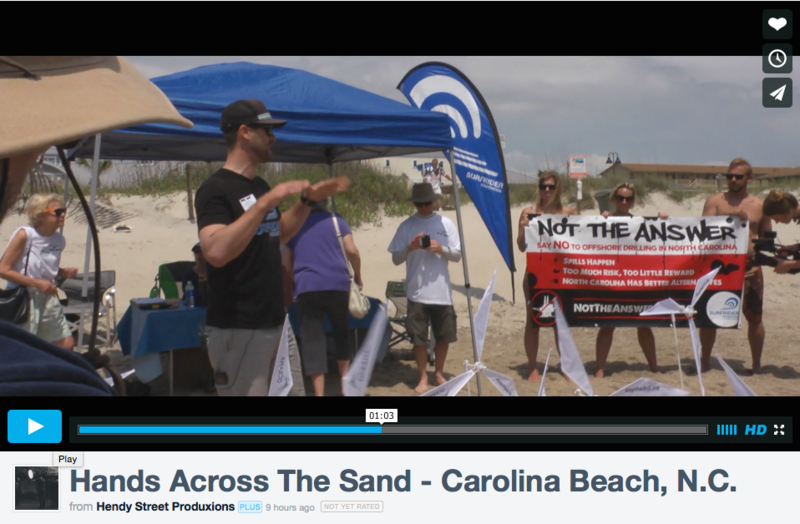 South Atlantic – The Outer Banks (video/ article), Cape Fear (video/ article), and Charlotte Chapters (article) rallied their HANDS around the Not the Answer NC campaign; the Grand Strand (SC) and Georgia Chapters hosted HANDS against offshore drilling in the Atlantic. Mid-Atlantic – The Delaware, Virginia Beach (VA), Jersey Shore (NJ) (article), South Jersey (NJ) (article), Central Long Island (NY), and Ocean City (MD) Chapters (article/ video) hosted HANDS events against offshore drilling in the Atlantic. The Central Long Island (NY) Chapter hosted HANDS against a proposed liquid natural gas terminal at the Port Ambrose facility in New York (article). Northeast – The Maine Chapter organized HANDS to protest Governor LePage’s decision to support offshore drilling / join the Outer Continental Shelf Governors Coalition (video). Hawaii – The Oahu, Maui, Hilo, and Kona Chapters hosted HANDS in support of renewable energy and against offshore drilling. The events follow the passage of legislation in the state, committing Hawaii to generating 100% of its electricity from renewable energy by 2045. California – South Bay and San Luis Obispo hosted HANDS against offshore drilling; Ventura tackled hydraulic fracking. With the federal government considering a dramatic expansion of offshore drilling in U.S. waters into the Atlantic and new regions of Alaska, Hands Across the Sand participants showed President Obama, congress, state legislatures, and state governors the breadth of opposition to new drilling, as well as support for clean energy. You can help protect our waters from offshore drilling and dirty fuels by asking your representatives to support legislation to protect new areas from offshore drilling.